Today was A First !! Rexit came to the little patio wall, threw him a suet pellet and down he came. We played the game for a moment and then !!!! she flew down so I threw her a pellet. Without a moment's hesitation Raquel came down and retrieved it . I just knew we're going to have trouble with this one ; bit fast and pushy. Aaaanyway, extremely unusual to have a female robin willing to get close and personal prior to the frantic "feed the babies at all costs" phase which is a way off yet. Whenever the push to reproduce kicks in it looks like you've won the contract for the catering. This morning I was throwing Rexit his little pieces of suet pellets; I could see him but he didn't leave the pyrawotsit. Strange. Then I heard the very quiet semi-voice twitter from the bush - that was his mate. He immediately forgot all about me and disappeared. I saw my robin, 2 days in a row now, feeding the other robin . I don't think its a fledgling because the red chest is visible. I assume its a female because the red chest is smaller and softer colour. 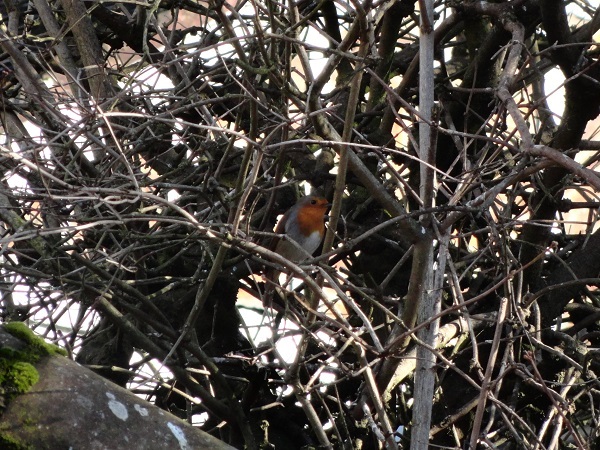 Is that usual, for robin to feed its mate, away from the nest ? There are no visual differences between the sexes in Robins. I think it is a courtship ritual. This is a mega-First; feel very privileged !! Spotted robin (assumed it to be Rexit) perching on top of feeder cage so took out a varied and nourishing selection of mid-morning snacks. The game lately is to throw a suet pellet in the general direction and down comes the robin for 'personal' tasty - a little ritual enjoyed by all . Pellet duly launched - no response . Repeated and again nothing. 4 times I did it and then realised that a robin was singing from a tree so this one must be Raquel . Not really unusual 'cos she's a bit bold this one, but normally it's Rexit. However - suddenly Rexit appeared on side wall, flew straight onto cage roof (me about 3 ft away) and they mated . They then flew into a conveniently placed pyrawotsit and mated again . Not given to laughing out loud first thing in the morning, but that did it !! !